Doctor has me off work for today & tomorrow. I follow-up with them on Wednesday. I think it is time to work on some writing projects. A little photo editing, perhaps? Tea in my cup. Brownies in the oven. I am thinking of that moon this morning at 6:45 am. It was large! Lopsided. Almost full. If I were to train for yet another career what would it be? The moon is like a lop-sided egg. A potato chip moon, organic with a dash of sea salt and turmeric, because the moon is a mellow yellow. The moon chants drive away, a way up this hill there is a promise on the other side. South Westerly breezes have rivers running early. 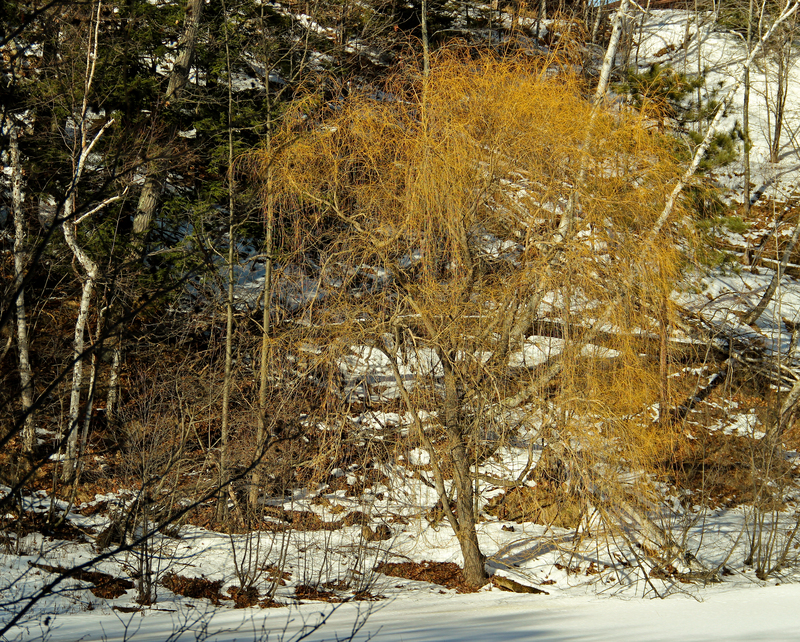 The dogwood is red and willow is gold. I hear cardinals singing. It is leap year and only the sixth day of February. My daughter turns 27 on Tuesday. And I am off work. I want to go to the park with my daughter and swing high, laughing, at potato chip moon as it grows full. Posted on February 6, 2012, in Memory and Memoir. Bookmark the permalink. Leave a comment.